As an Authorized Systems Integrator for FANUC Robotics since 2000, Kaufman Engineered Systems applies FANUC robot technology to provide customers with turnkey end of line system solutions. Whether as simple as a single cell palletizing system, or as complex as a multi infeed build station — we’re prepared to match your requirements. No matter the task, we will treat your project with the same integrity and professional response our customers have come to expect and trust since 1946. 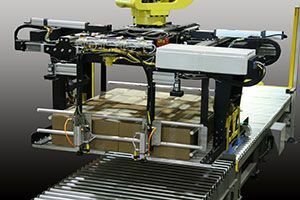 Enjoy the benefits of our palletizing and depalletizing machinery and discover why hundreds of successful companies have chosen Kaufman Engineered Systems as their single source manufacturer for complete line automation. Contact our award winning account managers for a free consultation. Call 419-878-9727 or email us at info@KES-USA.com. 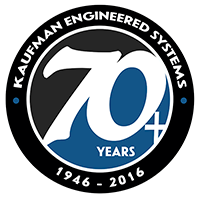 Why Companies Choose Kaufman Engineered Systems? Stability: With over 70 years of serving our customers, Kaufman continues to provide innovative products backed by five-star service. Quality: No one can match our machinery’s superior construction and durability. Dependability: With our 24-hour service support, you can count on Kaufman to be there when you need us most. In House Design and Manufacturing: Kaufman employs a full staff of electrical, mechanical, and robotic engineers to design and install the machines that meet your specific needs. Commitment to Excellence: We are customer focused, and we recognize that there are no universal automation solutions. Your needs are thoroughly analyzed and reviewed by our engineering staff to find the most efficient, cost-effective solution for your business. Your Turn-Key Provider: From machine fabrication to installation and start-up, Kaufman is there to support you. Improve your Bottom-Line: Whether it’s shaving seconds off cycle time or squeezing space out of your plant layout, we are committed to improving your efficiencies and operating costs.